Visit Backbone Rock, one of the world's most interesting rock formations! Backbone Rock is one of the most unusual rock formations in the world. It is a long, narrow stone ridge that extends from adjacent Iron Mountain. "The rock" stands approximately 75 feet high and 20 feet thick. Beautiful Backbone Rock Falls is located just across the road! Since the area surrounding Backbone Rock is extremely rich in wildlife and natural resources, it was a favorite hunting ground and home for the local Cherokee Native American (Indian) population for many centuries. In the early 1900's the timber industry was booming in the area. In 1901 a railroad track was laid to transport timber from the Shady Valley, TN area north to the Tennessee Lumber Company's sawmill in the Sutherland Community, just south of Damascus, Va. When the team building the railroad reached Backbone Rock they had to come up with a way to get around the stone ridge. They quickly decided that the easiest and cheapest way was to simply go through it! So they blasted a hole through the rock creating the world's shortest tunnel. The track was then built on up through Sutherland and into Damascus where it met up with the Virginia-Carolina Rail Line (now the Virginia Creeper Trail). The area's timber was pretty much all harvested within a dozen years or so and the sawmill at Sutherland was shut down. The railroad tracks were eventually replaced by a road, making Shady Valley and northeast Tennessee easily accessible from Damascus. In the 1930's, the Civilian Conservation Corps (CCC) built stairs and a trail to enable visitors to climb and cross the rock. You can actually walk across the rock and look down at the highway directly below you! The CCC also built shelters and picnic areas just north of the rock. Today, the Backbone Rock Recreation Area features the rock itself, the adjacent Backbone Falls, swimming and fishing in Beaver Dam Creek (the small river that flows past and around the rock), hiking trails, and camping facilities (with water and restrooms). 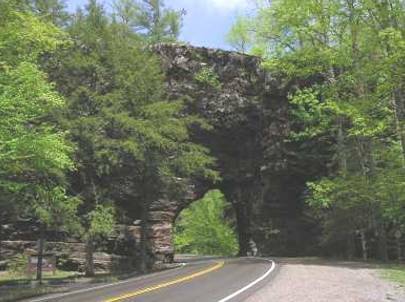 From Shady Valley, TN, follow state route 133 north for approximately 10 miles to Backbone Rock. From Damascus, Va, follow Shady Avenue (state route 133 in Tennessee) south for approximately 3 miles.